This is the second puffed cracker to appear on fivetwentysix. My menus often share a common thread of the progression and structure of dishes, with the ingredients varying based on taste or seasonality, in a manner not dissimilar to seasonal variation within the traditional Japanese kaiseki meal structure. In this case I like puffed crackers as a vehicle for all manner of toppings, usually seafood-based, as they provide a nice crunchy textural contrast to the dish that precedes them. 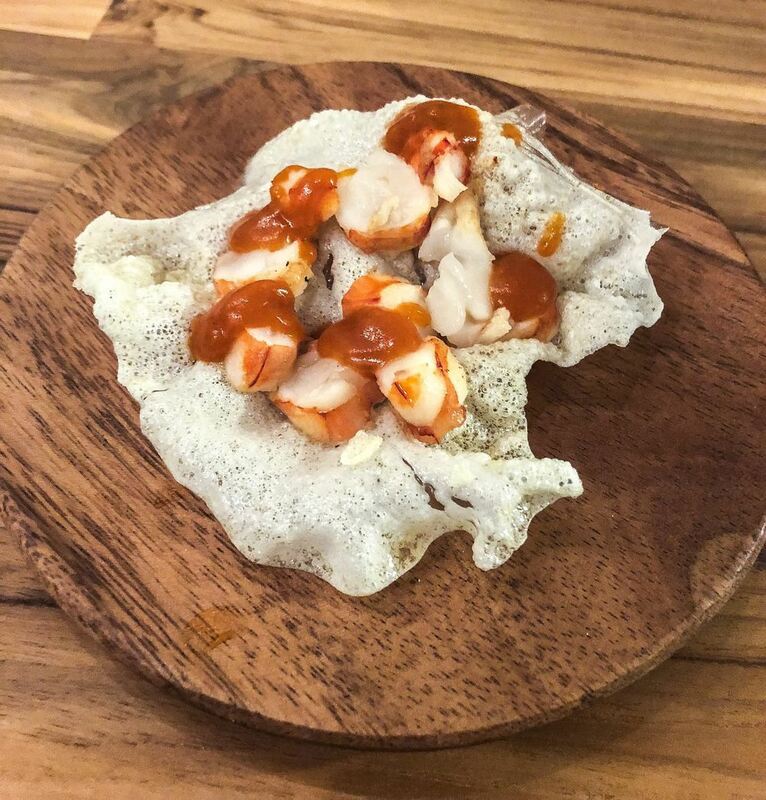 This variation uses a very thin and light puffed rice cracker (shoutout to ChefSteps), topped with prawns and a spicy chile sauce infused with the prawn heads and shells (remember from before: don't waste your shells!). After practicing these crackers about a half dozen times, I still struggle with it sometimes. It's tricky to achieve the perfect level of dehydration necessary for frying - too wet and the cracker is unusable; too dry and the crackers will not puff. Done properly the crackers should puff up in blisteringly hot oil in about 2 seconds. Make sure to pat them very well with paper towels so they're not greasy, and plan for relatively substantial yield loss; I make this quantity to select 4 perfect crackers to serve. Prepare the puffed rice crackers (up to 8h in advance): Combine the rice and water in a pot. Bring to a boil, reduce to lowest heat and cook covered for 25m. Blend with any remaining water until smooth. Spread about ~120g very thinly and very evenly onto dehydrator trays lined with silicone mats and dehydrate at 122F for 1.5h, up to 2h if necessary. Leave some headroom above each tray as the sheets will curl upwards. When the sheets are crispy and not tacky, break into chips and deep fry at ~420F; the chips should puff up in about 2s. Hold the chips down with a spider strainer to prevent curling upwards. Drain on paper towels and season very lightly with salt. Reserve in an airtight container with a silica desiccant until needed. Prepare the prawn stock (up to 8h in advance): Saute the prawn heads/shells in a pot with oil until brightly colored. Add all remaining ingredients, season with salt, bring to a boil then simmer mostly covered on low for 45m. Adjust seasoning. Strain. Prepare the prawn/chile sauce (up to 8h in advance): Measure 400g of the prawn stock. Dry-blend the low-acyl gellan gum and the xanthan gum. Blend into the prawn stock with a hand blender. Blend in the gochujang. Transfer to a pot and bring to a boil to hydrate the gum. Strain. Chill until set into a gel. Blend the set gel until smooth. Adjust seasoning. Strain. Chill until needed. To serve: Warm the prawn/chile sauce to serve and transfer to a piping bag. Season the prawns and saute in a very hot pan with butter for about ~20-30s on each side. Slice thinly and arrange the slices on a rice cracker. Top with some dots of the prawn/chile sauce.